high-performing applications from the data center to wide-area networks (WAN) and local access networks (LAN). The goal is to provide enterprises with complete visibility into their networks, automating network and policy configuration while managing applications across the WAN and access networks. both physical and virtual environments. The Cisco APIC Enterprise Module is constructed of three elements: a consolidated network information database, policy infrastructure and automation. To address security concerns, Cisco APIC automates network-wide rapid threat detection and mitigation by integrating and automating Cisco Sourcefire security solutions. For compliance management across branches and headquarters, Cisco APIC also provides network-wide Quality of Service (QoS), and accelerates Intelligent WAN (IWAN) deployments. It can also be used with third-party solutions to provide an end-to-end WAN orchestration and management. Cisco said its APIC frees up time for IT that would otherwise be spent configuring networking equipment and updating policy changes device by device. It automates many IT functions enabling configuration and policy changes to be pushed out to the individual components of the network instead of requiring IT to update each one manually. It also enables policies to automatically adapt to network changes which would be very difficult to set otherwise. Cisco APIC supports both new and existing network infrastructures via a selection of network Application Programming Interfaces (APIs), including OpenFlow, Cisco onePK and Command Line Interface (CLI). The Cisco APIC Enterprise Module also supports both new SDN-ready devices as well as older Cisco network equipment, enabling the same IT automation as with Cisco ACI for a large existing installed base that eliminates the need to rip and replace existing networking equipment to take advantage of this new functionality. The Cisco APIC Enterprise Module leverages the Glue Networks' "Gluware Intelligent Orchestration Engine"
The Cisco APIC Enterprise Module will be available at the end of the first half of 2014 and at no additional cost for existing and new Cisco SMARTnet customers. In November 2013, Cisco unveiled its Application Centric Infrastructure for data centers and clouds. In a press event in New York, John Chambers described ACI as the next big transformation of the IT industry driven by imperatives of the application economy. ACI is a step beyond virtualization and software-defined networks (SDN), said Chambers, because it brings agility and automation with full visibility and integrated management of both physical and virtual networked IT resources at the system, tenant, and application levels. The architecture promises a pay-as-you-grow mode scaling to over 100,000 switch ports and capable of supporting more than one million IP end points in a data center spine with 60 Tbps capacity. A key premise is that the network should adapt to application requirements through dynamic insertion and chaining of physical and virtual L4-7 network services including firewalls, application delivery controllers, and intrusion detection systems. The new architecture is designed for multi-tenant cloud environments by providing real-time view of per tenant and per application health, statistics, and troubleshooting. Real-time analytics will be used to drive intelligent application placement decisions. 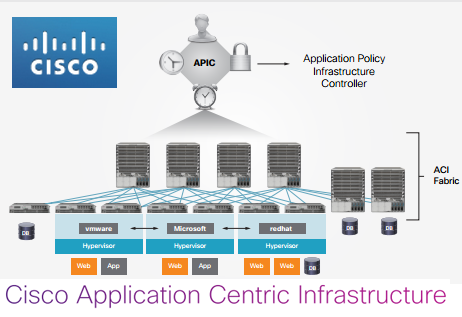 The foundation for ACI is an Application Policy Infrastructure Controller (APIC), enhanced versions of the NX-OS data center switching operating system, and a new line of Nexus 9000 data center switches based on technology from Insieme Networks, the Cisco spin-in start-up that is being acquired and re-integrated into the company. fabric. It will be delivered as an appliance. 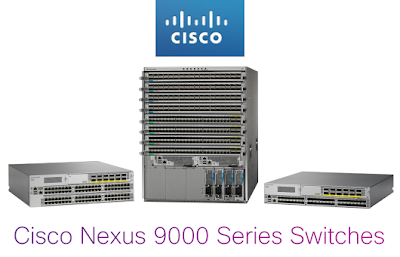 The new Nexus 9000 platforms will be able to run both optimized NX-OS and an ACI-mode of NX-OS via the addition of APIC. Cisco said this dual capability provides investment protection and a migration path to ACI though a software upgrade. The new switches will use custom ASICs for scalable and merchant silicon for addressing time to market issues. Cisco said its platforms will support 1/10/40G ports with support for future 100G transitions in existing and next generation data centers. 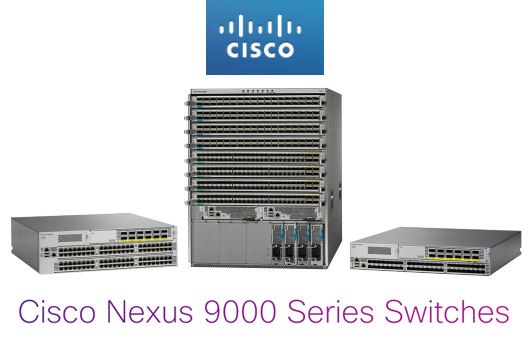 Another innovation in the Nexus 9000 portfolio is a backplane-free modular switch design that promises more efficient power and cooling. Both the Cisco Nexus 9500 and 9300 platforms support VXLAN and NVGRE bridging and routing functions in hardware. Cisco introduced a hybrid cloud solution, dubbed Cisco InterCloud, that aims to support many interconnected public, private and hybrid clouds. Cisco InterCloud, part of the Cisco One platform, is infrastructure software that will enable organizations to combine and move workloads – including data and applications – across different public or private clouds securely while maintaining associated network and security policies. The goal is to be able to move workloads to and from participating cloud providers with Cisco Powered services, such as BT, CSC/ServiceMesh, CenturyLink Technology Solutions, and Virtustream. In addition, Cisco InterCloud has been designed to move workloads to and from multiple public clouds, including Amazon Web Services and Microsoft Windows Azure. Cisco InterCloud will provide workload mobility and is intended to integrate with cloud management solutions such as Cisco IAC, as well as CSC/ServiceMesh's Agility Platform, Red Hat CloudForms, and other products from Cisco's ecosystem partners. Other leading technology partners supporting Cisco InterCloud include EMC, Citrix, Denali Advanced Integration, Microsoft, NetApp, Rackspace, VCE and Zerto. Marlin Equity Partners announced plans to integrate the majority of Tellabs into its new Coriant optical transport company, while spinning off the access product line of Tellabs into an independent company. Marlin's acquisition of Tellabs was completed in December. Tellabs currently supplies packet-optical, mobile backhaul and Optical LAN networking solutions to telecom service providers, independent operating companies, MSO/cable companies, enterprises and government agencies. Under this plan, the optical LAN product line will be spun out into Tellabs Access, which will also continue to provide residential access products to service providers. Mike Dagenais has been named President and CEO of Tellabs Access business. Previously, Dagenais served as CEO of Radisys Corporation and as president and CEO of Continuous Computing. He also served as president and CEO of Optical Solutions, Inc. and president and COO of Convergent Networks. 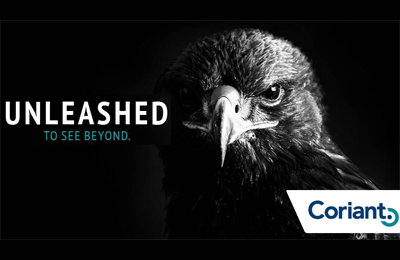 Coriant gains Tellab's packet-optical and mobiel backhaul businesses. Marlin has appointed Bob Leggett as Chairman of the Coriant Board, Pat DiPietro as CEO and Herbert Merz as President and Chief Operating Officer of the unified organization. Dan Kelly will step down Tellabs’ President and CEO. “From mobile cell sites to mission-critical enterprises and cloud data centers, the demand for agile broadband connectivity is fundamentally reshaping network and service requirements. The combined technical expertise and complementary product portfolios will significantly strengthen Coriant’s ability to deliver high-value end-to-end solutions to service providers, while accelerating Coriant’s leadership in software-defined networking, programmability, and automation for next-generation transport networks," stated Pat DiPietro, Chief Executive Officer, Coriant. Google agreed to sell its Motorola Mobility subsidiary to Lenovo for $2.91 billion. The deal will require approval from U.S. and Chinese regulators. Google, which acquired Motorola Mobility in April 2011 for $12.5 billion, said it will retain the majority of Motorola's patents in order to defend the Android ecosystem. 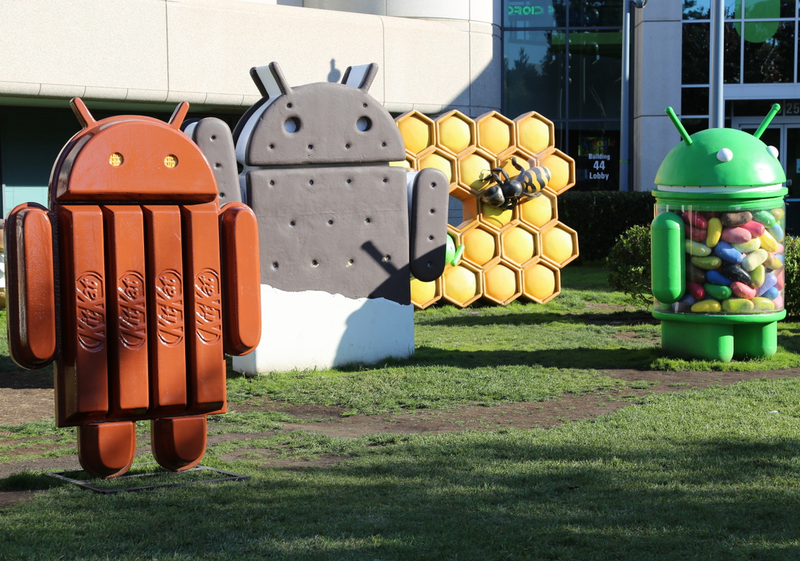 The sale of Motorola enables Google to ensure a more level playing field for Android. AMD showcased a development platform for its first 64-bit ARM-based server CPU and announced the upcoming sampling of the ARM-based processor, named the AMD Opteron A1100 Series. 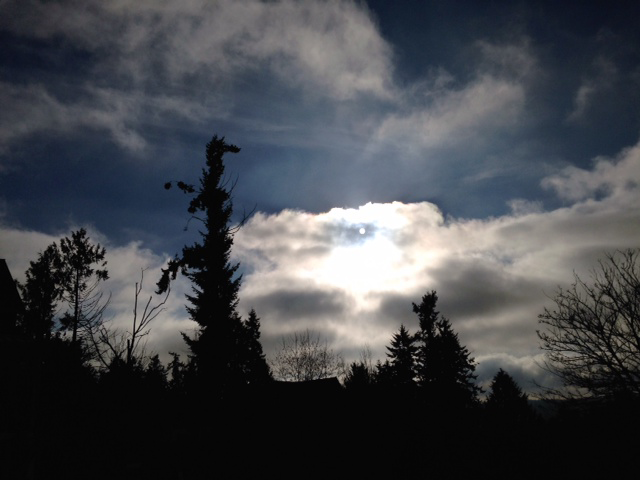 "The needs of the data center are changing. A one-size-fits-all approach typically limits efficiency and results in higher-cost solutions,” said Suresh Gopalakrishnan, corporate vice president and general manager of the AMD server business unit. 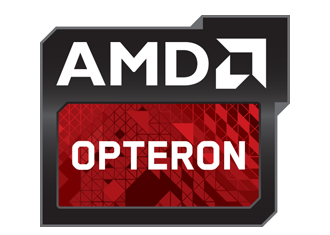 “The new ARM-based AMD Opteron A-Series processor brings the experience and technology portfolio of an established server processor vendor to the ARM ecosystem and provides the ideal complement to our established AMD Opteron x86 server processors." Qualcomm posted record quarterly revenue of $6.62 billion for its first quarter of fiscal 2014, up 10 percent year-over-year (y-o-y) and 2 percent sequentially. Net income came in at $1.88 billion, down 2 percent y-o-y and up 25 percent sequentially. ADVA Optical Networking launched a new Ethernet Services Suite (ESS) that provides customer support over the lifecycle of an Ethernet product. The professional services are designed to help carriers design, deploy, operate and maintain Ethernet networks. ADVA will deliver the services using a global team of Ethernet experts. "Every aspect of ESS has been developed to simplify operations, to strip away complexities, to help service providers focus on their core business,” said Phillip Needel, manager, Service Business Development, ADVA Optical Networking. "ESS is essentially an a la carte menu that covers the full gamut of Ethernet services." Infinera reported Q4 2013 GAAP revenues of $139.1 million compared to $142.0 million in the third quarter of 2013 and $128.1 million in the fourth quarter of 2012. GAAP gross margins for the quarter were 40% compared to 48% in the third quarter of 2013 and 34% in the fourth quarter of 2012. GAAP net loss for the quarter was $(10.2) million, or $(0.08) per share, compared to net income of $3.3 million, or $0.03 per diluted share, in the third quarter of 2013 and a net loss of $(16.1) million, or $(0.14) per share, in the fourth quarter of 2012. “The fourth quarter was a solid finish to a very good year for Infinera, driven by continued acceptance of the DTN-X,” said Tom Fallon, chief executive officer. “We received purchase commitments from three additional customers in the quarter, including one new to Infinera, and we set another quarterly record for 100G port shipments. “Our financial results for 2013 demonstrate the strong potential of the DTN-X. Revenues grew 24%, at least double the long haul DWDM market growth estimated by industry analysts; gross margins expanded significantly; we achieved $4 million Non-GAAP net income compared with $43.5 million Non-GAAP net loss in 2012; and we generated $12 million in net free cash flow for the year. Since its introduction in mid 2012, we have received purchase commitments for the DTN-X from a total of 42 customers, representing a cross section of industries including Tier 1 carriers, cable operators, Internet content providers and bandwidth wholesalers. Of these, 15 are new customers to Infinera. These achievements met or exceeded the targets that we provided at our Analyst Day in December of 2012. The Mobile Backhaul equipment market, consisting of Transport and Routers & Switches, is forecast to reach $8 billion by 2018, according to a new report by Dell'Oro Group. Routers & Switches for mobile backhaul are projected to grow at a five percent compounded annual growth rate and to comprise nearly 35 percent of total mobile backhaul market revenue by 2018. The primary growth driver will be the shift to a packet-based backhaul network as operators roll out LTE and LTE-advanced. The Transport portion of mobile backhaul is forecast to grow at a two percent compounded annual growth rate. The primary growth driver for Transport will be the addition of new macro and small cell sites, along with the upgrade of any older low-capacity backhaul systems. “Mobile backhaul is a critical contributor to carrier microwave, routing and switching growth over the next five years,” said Jimmy Yu, Vice President of Mobile Backhaul Market Research at Dell’Oro Group. “We anticipate the pace of cell site deployments will gradually increase over this period as operators expand their LTE footprint and begin to roll out small cells. We also expect outdoor small cell backhaul to drive at least 10 percent of mobile backhaul revenue by 2018,” added Mr. Yu. The Wireless Packet Core Equipment market is forecast to grow almost 60 percent, comfortably exceeding $6 billion by 2018, according to a new report from Dell'Oro Group. All growth during the period is expected to come from the Evolved Packet Core segment of the market. Analysis and forecast of the use of NFV-based licenses is included.